Our product range includes a wide range of rubber teats. In order to retain remarkable position in this industry, we are providing a wide array of Rubber Teats. These teats are made of SBR, Butyl, Nitril and Natural Polymer and are available in different colors and sizes. 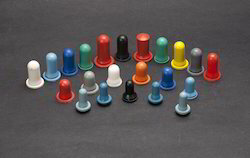 They are commonly used in droppers for dispensing drops. We provide these teats in various sizes, colors and designs according to the needs of the clients. Looking for Rubber Teats ?